Think beyond a bottle of wine. The holidays might still be a while away, but fall entertaining season is officially upon us. In order to avoid the last-minute stress of finding the perfect hostess gift, we’ve done the heavy lifting for you. Get ahead by picking up a few key presents to have on hand for all types of get-togethers. Here, some of our favorite gifting ideas, all under $50, to shop now—before you panic-gift another bottle of wine. The perfect tie-in to the dinner party you’re probably attending, this Assouline book makes stylish entertaining and good food attainable. In keeping with Missoni’s vibrant and instantly-recognizable aesthetic, the cover is a striking rainbow-checkered pattern. Not only will your gift recipient get some delicious new recipes to try from one of Italy’s most famous families, but they’ll also get a fabulous new coffee table book that deserves to be shown off. When in doubt, opt for washed linen: The perennially chic fabric looks great in any room of the house, which is why your hostess will definitely appreciate this deep red towel for their kitchen. It’s an easy way to bring in a pop of color that doesn’t require repainting the space. Any foodie in your life will get a kick out of this Italian import. Artisanal olive oil is one of those things that most people may buy for themselves, which is what makes this such a thoughtful gift. If it’s a more casual get-together you’re attending, pair it with some fresh bread from your favorite bakery and maybe a selection of cheeses, and boom: You’ve basically taken care of pre-dinner bites. Buy a couple of these tiny glazed cups and gift along with an espresso blend for the perfect morning pick-me-up package. If anything, it’ll come in handy for reviving your host the morning after their fête. Give the gift of relaxation with a set of incense. East Fork is one of our favorite pottery brands, and the little incense burner this set comes with is crafted in their signature simple, sophisticated manner. As far as kitchen utensils go, this one’s pretty snazzy. 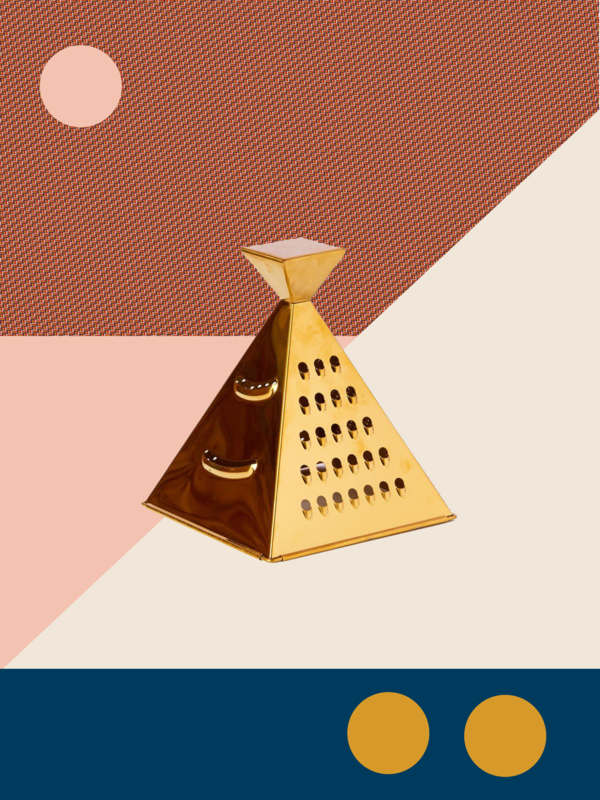 A metallic gold pyramid that’s as fashionable as it is functional has a definite place in any host’s kitchen; they’ll probably even want to proudly display it on their open shelving as a sculptural object. This dusty blue accent piece is purely decorative—be sure to warn your host not to accidentally fill it with water. Instead, use it as a home for some dried flowers or eucalyptus. They can even keep it empty and set it on a mantel or coffee table as the perfect minimalist pièce de résistance. his simple yet colorful terracotta tapas bowl is an easy, crowd-pleasing gift. It’s actually part of a set created by Dassie Artisan, so if you’re feeling particularly giving feel free to toss in a couple other pieces from the collection (we also love the bento ramakin bowls) for a more rounded-out giftable. Ombre candles are a little luxury we didn’t know we needed until we saw these beauties. Each purchase comes with four different colors, so your giftee will have options to burn for a long time to come. Plus, colorful tapered candles are always a great last-minute centerpiece solution for any holiday tablescape. Speaking of, your hostess will need something in which to display their stunning new candles. A modern candlestick that almost looks like a sculpture is the way to go. Ferm Living’s black brass option is uber cool, making a great contemporary addition to any space.